What more to say? We love games so much that we like to talk and write about them too! If you share , disagree or have other vie points... we'll be glad to have you onboard. Games influence people of different culture. Wann know how?! We'll range from anything important from GAMES to the meaning of life. Don't worry... GAMES will always be the main topics at hand, after that anything goes. ;) No prejudice. The GAMES are all that matter here. So, user Agrias over at Mangahelpers was nice enough to upload some scans of this book. For anyone who doesn't know, Databooks are a common class of books published by many mangas (specially long running ones) in which the creative team of that manga put out vital and/or non-vital statistics concerning characters, events, backgrounds, consequences, abilities and plot-lines for the respective title. **Note: The embedded skill chart was edited by me, but using the information provided in the image's description. The basic rule by how this class of chart works is simple: the more the color area covers, while pointing towards one specific attribute, the more skillful the character is at that particular attribute. It's nice to finally be able to see some stats since the two year gap in Naruto, the Itachi vs. Sasuke fight and the appearance of Pain. It helps in giving some idea of the growth the characters have gone through and realize what some of the new faces in the manga are capable of. Some characters stats are still a mystery, given that they have not made a move or the real extent of their abilities are unknown 'til this moment, and on the other side, some characters may have not yet shown their skills to the fullest capacity. Tobi was saying the truth, Itachi was stronger than Sasuke and let him win. 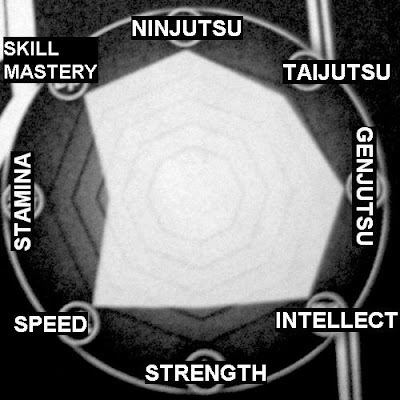 I'm not saying that Itachi is stronger in the sense of physical strength, but as the overall ninja he was superior to Sasuke in almost every aspect. So I will have to give this one to Tobi's side of the story as it is now basically a fact in reference to these stats. So, the way Sasuke won was by having an edge over Itachi (Itachi's illness) and by Itachi not really going "all out" from the beginning by having orchestrated the end result to go in favor of Sasuke. This last statement explains why Itachi was very close to killing Sasuke like 10 times before exhausting (and didnt kill him). He also expelled Orochimaru out of Sasuke, that too, in such a way where Sasuke didn't perceive it...all because of his blind hatred towards Itachi at the time. It's true that Sasuke Uchiha's stamina is just a bit above Itachi's but it's not known if the creative team was counting on this pre or post loss of the Cursed Heaven Seal and/or a partition of Sasuke's M. Sharingan. Also, its fair to mention that Itachi's stamina was seriously affected by the continuous use of the M. Sharingan and how just using it once, drained alot out of him; not to mention the life threatening illness he had succumbed to, for who knows how much time. **Update: One point I failed to mentionn regarding Itachi's stamina was that before his fight with Sasuke he gave some of his power to Uzumaki Naruto. So that could have properly drained him of energy or overall lower his stats to some degree. Gamerhug is the best free online dating site for gamers. Users can upload photos, rate profiles, send messages, and meet gamers from across the globe. Gears Of War 2: Anime Or Gay Friendly? Halo 3 Secret ODST update?